to Fall in our hall. School reader in black and orange. I love living here by the state land and river. Always lots of waterfowl and wildlife galore. The other night the coyotes were howling. Plus my son got a tad scared Monday at dusk. into one of our empty cans. Lo and behold an opossum hissed at him. It must have got stuck at the bottom somehow. the can so he could walk away. Like I said wildlife galore around here. What kind of wildlike to have where you live? to Breckenridge, MI to do a prim show Saturday. My son will be holding down the fort here at home. birthday and Christmas presents there. Bob said to buy something for myself. Hope you all have a fabulous Autumn weekend. It is supposed to snow this weekend here. Time to get out the Winter coat and gloves. A Hall For Fall Blessings To All! You live in a beautiful spot and it’s the perfect place for your beautiful home, your treasures are amazing, best wishes at the event! I can’t wait to see what you bring home! Pretty fall hall! Our leaves turned pretty shades and have left us now. It goes too fast. We have lots of wildlife, from bears to tiny lizards. Lately foxes have been startling our kids at night. I live in the city, but we have a real problem with deer in the neighborhood. Skunks are not as bad as they were a few years ago, and I've even seen a flock a wild turkeys down the street. Your decorating as always is wonderful! We are in for snow tonight too a little to early for me. December is fine. We are in the woods so we have lots of animals too. Bear, fox, bob cat, raccoon, skunk and porcupine are a few that we have had in the yard in the past year. I hope you find a treasure at the show. We have plenty of wildlife here. My neighbor recently had a cougar on his trail cam - we were so surprised! He has cattle so he's not that happy. Have a great weekend. I love the hallway, looks like a nice cozy place to just sit and read. Lucky you to see the fox, here we have lots of oppussums some even take a nap on the shelf in the garage. We get deer sometimes, plenty of skunks too. We have had pheasants under the cedar tree and the neighbor had a coyote looking for small dogs . Hope you find some wonderful birthday gifts too have a great show. Thank you friends for reading my blog! I especially enjoy reading your comments. Welcome prim friends, My name is Janice and I am happily married to my best friend Robert (Bob). Together we own an antique store, live by the water (St. Clair River) and our home is filled to the brim with primitives. 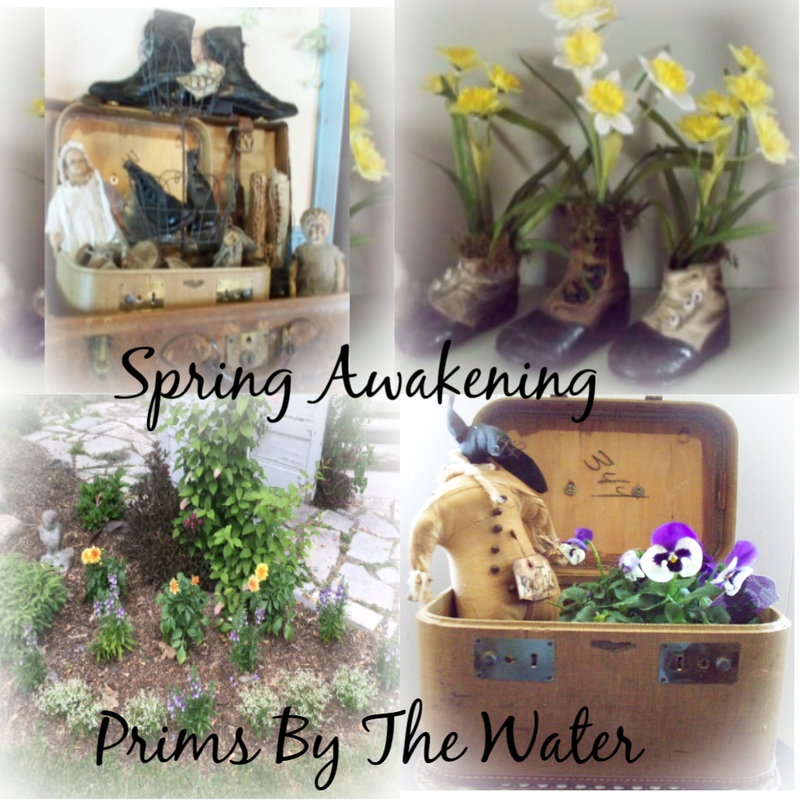 Hence the blog name, Prims by the Water. Here I will try to bring together both my love for primitive decor and primitive crafts with pictures and ramblings about our daily on-going undertakings...ok maybe not daily, but as often as I can; mixed in with memories of my childhood on both my paternal and maternal grandparents' farms.